The oldest of Generation X are turning 50 years of age, and many of them are at career crossroads! I am encountering many older Gen Xers who are questioning their career path (just like baby boomers who started doing this 10 years ago). In facing career crossroads, they are asking the same questions that baby boomers did, but for different reasons. Raised in single parent households – Almost half of generation X were raised in single parent households. Among those who are at career crossroads, there are almost as many who were raised by their fathers as by their mothers. Education was seen as a gateway to success and happiness – Almost all thought that, when they completed their degrees, they would get great jobs and achieve happiness. Many achieved the first goal but not the second. Single, unhappily married, or divorced – Because they were career driven, many delayed marriage. This is almost equally true of men and women. Those that are married, reaching a career crossroads is hazardous to their marriages. Why Are Career Crossroads Appearing Now? Most baby boomers can relate to why now. Whether you call it a mid-life crisis or just reaching your 40s, it is about expectations of what could or should have been. After working for 15 or 20 years, there was a certain expectation of success and happiness. Many who have been coming to me have the success, but not the happiness. Others have had success, got married late, had children late, and now have obligations that put serious constraints on their career. Do they continue to climb the corporate ladder or jump off and experience life? I had one female client who was an executive in her 40s—brilliant, successful, and single. She stated that she needed a non-working husband to take care of life chores, just as her male counterparts had non-working wives. Her work demanded 60 plus hours every week. She was exhausted from the politics. Instead, she decided to find a job that was more fulfilling and less demanding. She found that climbing the corporate ladder did bring happiness. These older Gen Xers entered the workforce in the late 1980s or early 1990s. This was when the idea of working for one employer was ending (I was at IBM in 1993 when they ended the no layoff policy). They had no illusion that their employer would take care of them. Therefore, many drove for career success in lieu of having a personal life. They delayed marriage and children. They thought that, if they worked hard, success and happiness would come. After they were successful and happy, they would get married and have kids. I was like most baby boomers. I went to college, got a job with a large father-like company (IBM), got married, had children, and would work until I retired. Work was not supposed to bring happiness. What I earned was supposed to bring happiness. In other words, stuff was supposed to bring happiness! The great recession and the new economy has caused many in all generations to approach career crossroads. Do you blindly follow a career path to earn a living and hope happiness will follow? 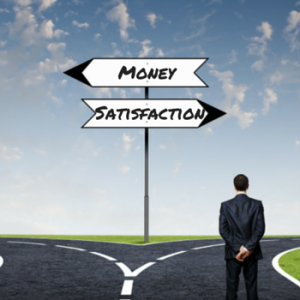 Do you pursue monetary success and think happiness will flow from that success? Do you follow your passion to attain happiness and the monetary success that will follow? Baby boomers followed path #1. Generation Xers followed path #2. Generation Y, who happen to be baby boomers kids, are following path #3. All three paths are flawed. These are my observations. What do you see?